The humble side table. It’s such a ubiquitous piece of furniture, that it’s easily overlooked. we believe in celebrating the small things — it’s why we make gloriously beautiful, practical outdoor furniture that’s a joy to use. Our side tables are no exception, and we love the challenge of making them great. Whether you need space for a drink or some delicious snacks, you want to rest a book or your smartphone, they’re designed to be the perfect shape and size to fit your needs. They pair perfectly with all of our furniture, and they’re available in a large range of colors, styles, and designs to complement any outdoor space. At POLYWOOD®, a table isn’t just a table. Instead, it’s an opportunity to create beautiful designs, vibrant colors, and innovative uses for the smallest of items. 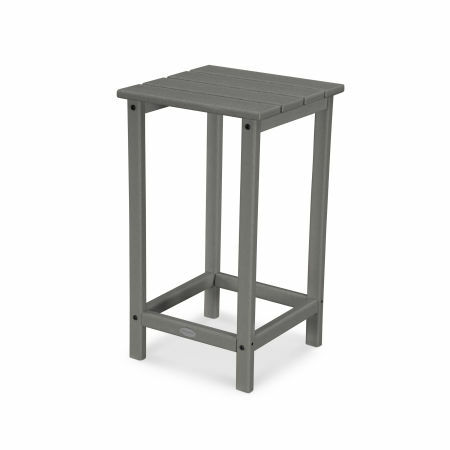 Whether you want tall, short, round, square, or rounded-corners, we have tables for every taste. 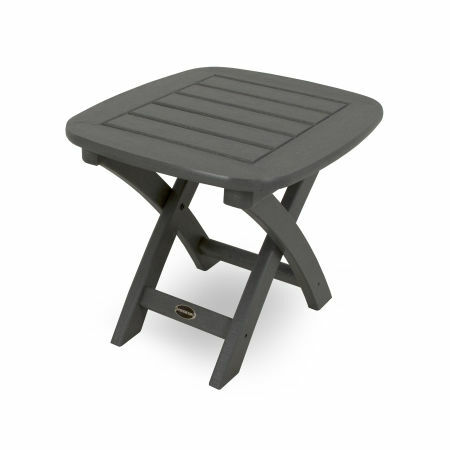 Many of our tables come with slatted tops to complement much of our other furniture like our Adirondack chairs, rocking chairs, dining chairs, and more. Many of our popular collections have their own accessorizing side tables, including Nautical, Long Island, and South Beach. 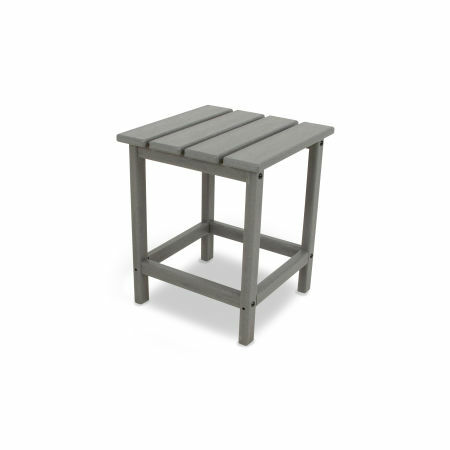 We also offer folding side tables, aluminium side tables, and two-shelf side tables. When you’re buying POLYWOOD® furniture, you can be confident you’re buying quality. Our unique HDPE lumber is superior to both traditional wood and plastic materials, and it’s perfect for your outdoor furniture. POLYWOOD® lumber is completely weather resistant, and unlike wood it won’t crack or rot. Its density and Color-Stay Technology also makes it superior to plastic as it won’t fade or split in the sun. Maintenance is a breeze too — you can even leave the furniture outside all year-round! POLYWOOD® furniture just requires a wipe down with a damp cloth and gentle soap. You’ve invited friends and family over for a celebration. Your side tables are the perfect place for drinks, food, and gifts. They stay out of the way when not needed, and are just an arm’s length away when they are. If you live in the city it can be difficult to find adequate outside space. 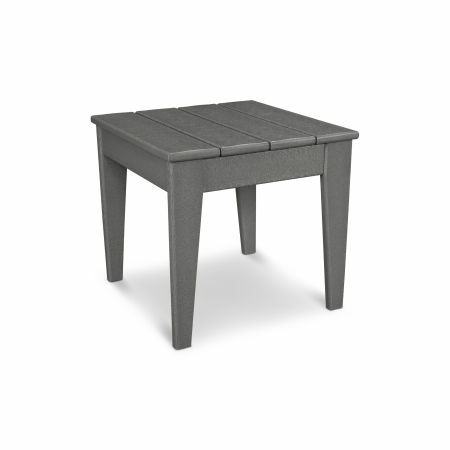 Our folding side table is the perfect solution. Designed to be easy to store, you can set it up outside for when you just want to gaze over the cityscape and enjoy the hustle and bustle of watching the life below. It’s time for s'mores and marshmallows! Get the firepit going, gather your graham crackers and chocolate, and toast those marshmallows. It’s time for s'mores and marshmallows! Get the firepit going, gather your graham crackers and chocolate, and toast those marshmallows. Tell stories by firelight, enjoy a well-spent evening with friends, and relish the enjoyment of hot, sugary goodness. What could be better?